There is a magic rock in St. Cloud, France. It’s made not of stone, but of a metallic alloy that’s 90% platinum and 10% iridium, and it’s magic not through some supernatural force, but because scientists have declared it to have a mass of exactly 1 kilogram. Now many scientists would like to get rid of it. Our civilization is built upon a system of measurement standards. If two people want to trade, they have to agree on what a pound is. If you pay a contractor to build a 100 foot tall building, you have to agree on the length of a foot. Throughout history humans have had standards of measurement, often dictated by governmental decree. But since the early 1800s there has been a quest to create a truly universal standard of measurements. This became the metric system, which was further standardized to the Système international d’unités (SI) in 1960. The SI standard has become the basis for measurement across the globe. They define the physical units we use to measure things. Even in the United States, quantities like the foot and pound are defined in terms of SI units. The most common SI units are those of the meter (length), second (time) and kilogram (mass). In the 1800s these were based upon the physical characteristics of Earth. A meter was defined by declaring the circumference of Earth to be 40,000 kilometers. A second was defined by declaring the length of an average day to be 24 hours long. A kilogram was defined as the mass of a liter (1000 cubic centimeters) of water. While these definitions initially worked well, as our measurements became more precise things became problematic. As measurement of the Earth’s circumference improved, the length of a meter would necessarily change. Since the volume of a liter is defined in terms of length, the mass of a kilogram likewise shifted. Precise measurements of Earth’s rotation showed that the length of a day varied, so even the second wasn’t entirely fixed. There are two ways to define a set of units that don’t vary. One is by defining a particular object to be an exact standard, and the other is to define units in terms of universal physical constants. The meter and second are now defined using the later method. For example, in Einstein’s theory of relativity, the speed of light in a vacuum is always the same. No matter where you are in the universe, or how you are moving through space, the speed of light never changes. It is an absolute physical constant. This has been verified through numerous experiments, and in 1983 it was given an exact value. By definition, the speed of light is 299,792,458 meters per second. By defining this value, we also defined the length of a meter. Since the speed of light is a constant, if you know how long a second is, you know the length of a meter. The length of a second is also defined in terms of light. By the 1960s we had developed atomic clocks based upon cesium 133. Like all elements, Cesium 133 emits light at specific frequencies. 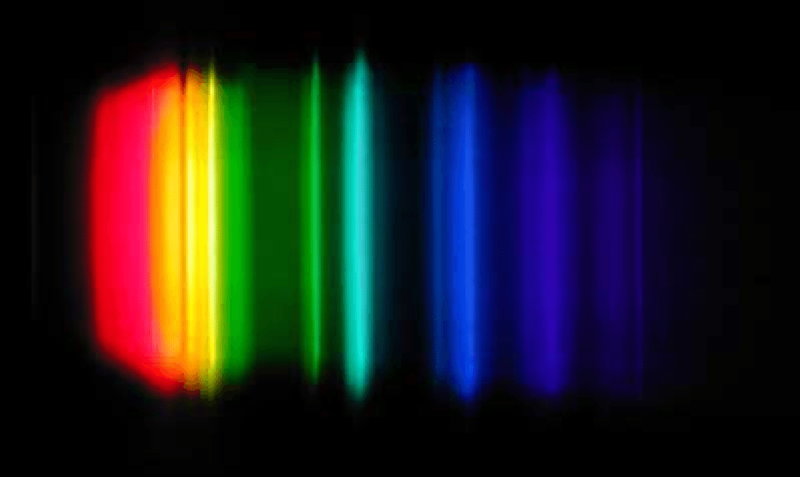 Light is emitted from an atom when an electron moves from a higher energy quantum state to a lower one, and under the right conditions they are always the same. One particular emission from cesium 133 is known as the hyperfine ground state, and it is used to regulate an atomic clock the way the swing of a pendulum regulates a grandfather clock. In 1967 the frequency of light emitted by this hyperfine transition was defined to be 9,192,631,770 Hz. By measuring the frequency, you know the length of a second. Since the meter and second are based upon physical constants, they don’t change. They can also be measured anywhere in the universe. If an alien civilization wanted to know what units we use, we could send them a radio message with the definition for meters and seconds, and the aliens could recreate those units. But since 1889, the kilogram has been defined by a specific chunk of metal known as the International Prototype of the Kilogram (IPK). If the aliens wanted to know the mass of a kilogram, they would have to make a trip to France. Besides the necessary road trip for aliens, there is a big problem with using a magic rock as the standard kilogram. Since the mass of the IPK is exact by definition, it cannot change under any circumstances. If someone were to shave off a bit of metal, it would still be one kilogram by definition. Shaving the IPK down a bit wouldn’t make the kilogram lighter, it would make everything else in the world a bit heavier. Of course, that doesn’t make any sense. Shaving down a bit of metal in France doesn’t make the Statue of Liberty weigh more. The problem is with our definition of mass. And in a sense this kind of thing actually happens. In addition to the official prototype kilogram, there are official copies all over the world. By comparing the copies to the IPK, we can determine the stability of its mass. This has only been done a few times over the years, but on average the mass of the copies has increased slightly compared to the IPK. 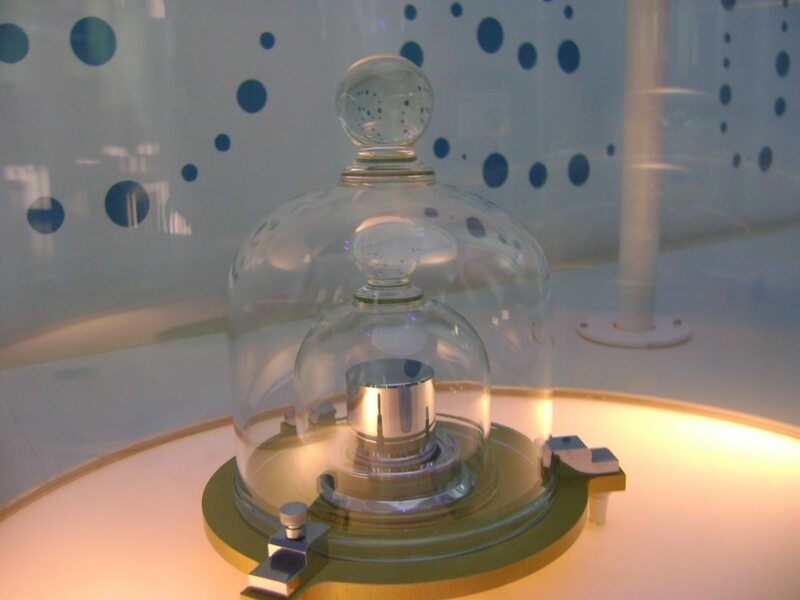 Either the official kilogram is getting lighter, or the copies are getting heavier. The standard kilogram hasn’t been replaced by a physical constant because we haven’t been able to measure them with enough precision. The obvious physical constant for mass would be the universal constant of gravity G. But gravity is a weak force, and measuring G is difficult. So far we’ve only measured it to about one part in 10,000, which isn’t nearly accurate enough to define mass. But there is another constant we could use, and it’s known as the Planck constant. The Planck constant lies at the heart of quantum theory. It was first introduced by Max Planck in his study of light. When objects are heated, they emit light, and the color of that light depends upon the temperature of the object. This is known as blackbody radiation. According to classical theory, most of the light emitted should have very short wavelengths, but experimentally this wasn’t the case. Planck demonstrated that light must be quantized proportional to a small constant h, which we now call Planck’s constant. 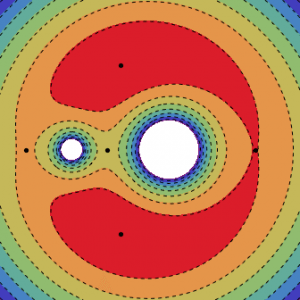 As our understanding of quantum theory grew, the Planck constant played a role not just in quantization, but quantum ideas of energy and momentum. In SI units, h has units of kg∙m2/s. If the Planck constant is defined to have an exact value, then the kilogram would be defined in terms of Planck’s constant as well as the meter and second. In principle it’s a good idea, but it can only be done if we can measure it accurately. In 2014 the Conférence Générale des Poids et Mesures (CGPM) decided that before such a definition could occur, three independent measurements of the Planck constant would need to be made, each with an accuracy of 50 parts per billion, and one accurate to 20 parts per billion. 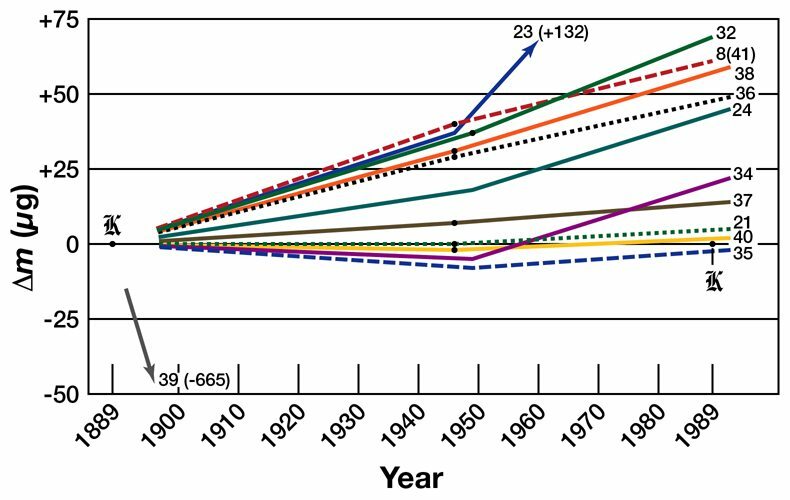 By June of this year three experiments have been done with uncertainties smaller than 20 parts per billion. The CGPM meets again in 2018, where it is expected they will officially define the Planck constant to be exactly 6.626069934 x 10−34 kg∙m2/s. When that happens the prototype kilogram will no longer be a magic rock, but simply a part of scientific history. And the aliens won’t have to make that road trip after all. Fundamental dose not change intrinic properties;it isn’t transforming into anything else .speed of light is the same way we measure time and length,Yes Brian you are talking Kg but Cesium is the 55th element in the periodic table ,when this element lowers one’s energy it changes to a photon 54,a well particular well defined energy,if you take 9,192,631,770 Cycles of that photon,that’s how we define one second. m/ s you get the definition of a meter.